Taman Negara is in Peninsular Malaysia. It was established in 1938/1939 as the King George V National Park after Theodore Hubback lobbied the sultans of Pahang, Terengganu and Kelantan to set aside a piece of land that covers the three states for the creation of a protected area. It was renamed Taman Negara after independence, which means "national park" in Malay. 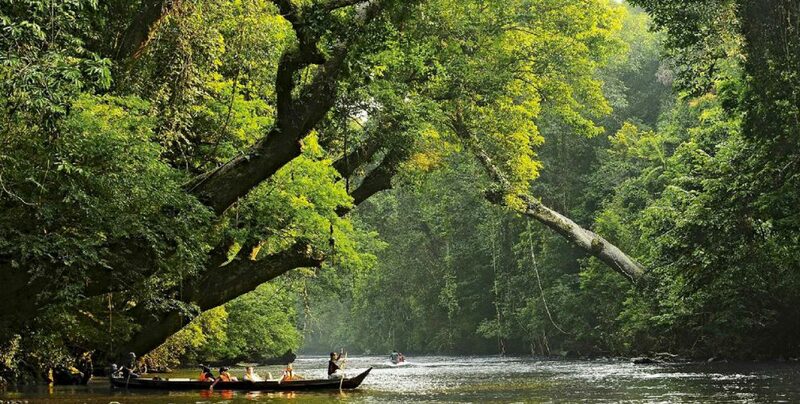 Taman Negara has a total area of 4,343 km2 and it is one of the world's oldest deciduous rainforest, estimated to be more than 130 million years old. Attractions found near Kuala Tahan (Park headquarters for Pahang) include a canopy walkway, Gua Telinga (cave system), Lata Berkoh (rapid). 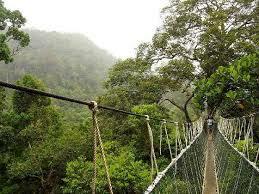 Visitors can enjoy the tropical rainforest, bird watching or jungle trekking (e.g. Tenor Rentis) and the river views along the Tahan River.